Typha latifolia (cattails) are among the most common of all aquatic plants. They are often a nuisance but also perform an important function in keeping a lake healthy by filtering the runoffs. Typha latifolia form dense monocultures when there is a wetland disturbance. They can reach up to 2 or 3 metres and grow prolifically from thick underground rhizomes, forming dense rhizome mats and litter which has an impact on species diversity by alteration of habitat. Dense Typha latifolia growth and litter may reduce the opportunity for other plants to establish or survive. Typha latifolia are very densely packed with tiny flowers, male flowers in top cluster and female flowers in bottom cluster (UoF, 2005). Stems can be more than one foot long. Leaves are straplike and stiff; rounded on back; flat and D shaped. Leaves are straight in the bottom half but twisted and spiral in the top (UoF, 1998). Leaves are thick and pale grayish-green in colour (NPWRC, 2005). It flowers during May and June. The fruit is tiny and tufted nutlet (NPWRC, 2005). 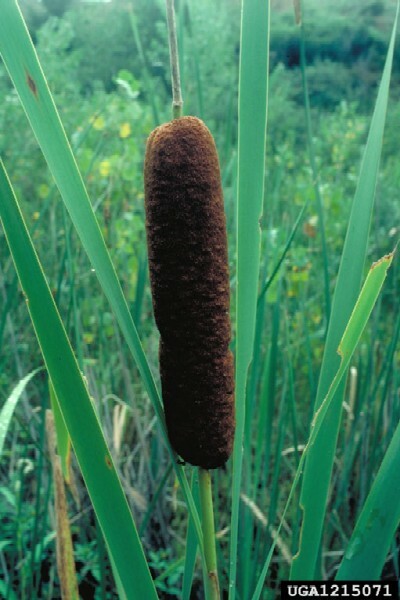 Boreal Forest (2005) states that cattail can be distinguished by the following “male flowers are brown, minute, >1.3cm long, thickly clustered, anthers 1-3mm long. Female flowers are tiny, 2-3mm long when in flower, 10-15mm long when in fruit. Female fruiting spike are pale green when in flower, drying to brownish, later blackish brown or reddish brown in fruit. Seed are minute and numerous”. Uses for Typha latifolia over time have been many; it has been: used for thatch in roofing, or woven into mats, chairs and hats; a source of fiber for rayon and a crude, greenish brown paper; torches and tinder; pollen used in making fireworks; stuffing pillows, insulation, crude floatation devices, wound dressing, and lining for diapers (Boreal Forest, 2005). T. latifolia stands provide important food cover for wildlife and birds. They establish habitats for waterfowl and especially valuable in attracting nesting red-winged blackbird. Muskrats use the foliage to construct their lodges, which in turn provide resting and nesting sites for water birds (Rook, 2004). Many parts of this plant are edible for human consumption. Rook (2004) states that the “native Americans used leaves and stems as food. Rhizomes were dried and ground into flour or eaten as cooked vegetables; young stems were eaten raw or cooked; and immature fruiting spikes were roasted”. In spring, the rootstocks and rhizomes were important food source for native people when other food was scarce (WSDoE, 2003). The young shoots were cooked as vegetables and the pollen are used in baking (WSDoE, 2003). Rook (2004) reports “all our wetland plant communities from deep marshes to open bogs, growing on wet substrates and often in 1-2 feet or more of standing water. It grows where soil remains wet, saturated or flooded most of the growing season, in shallow freshwater and occurs in slightly blackish marshes. It prefers soil with high amounts of organic matter and can also grow on fine texture mineral soils. Typha latifolia rapidly colonizes exposed wet mineral soils, as it produces an extremely high number of wind water dispersed seeds (Rook, 2004). Reproduces by seed and vegetatively by rhizomes. Vegetative reproduction occurs through an extensive rhizomes system and is responsible for the maintenance and expansion of existing stands. Sexual reproduction is via seed dispersal and seedling establishment is responsible for invasion of new areas”. T. latifolia seed may be transported by wind, in water, in mud on the feet of birds and livestock, or by humans and machinery. Up to 95% of all seed produced is viable (DPIEW, 2005). Recommended citation: Global Invasive Species Database (2019) Species profile: Typha latifolia. Downloaded from http://www.iucngisd.org/gisd/species.php?sc=895 on 22-04-2019. Motivans and Apfelbaum (1987) listing out the impacts of the genus Typha state that they form dense monocultures when there is a wetland disturbance. They have the ability to spread rapidly by vegetative reproduction forming forming dense rhizome mats and litter. This has an impact on species diversity by alteration of habitat. Dense Typha growth and litter may reduce the opportunity for other plants to establish or survive (Wesson and Waring 1969 in m). They rapidly close any open water giving few oppurtunities for other plants to establish. Physical: Control techniques of fire and physical removal (cutting) in conjunction with flooding are most appropriate. Motivans and Apfelbaum (1987) suggest that draining techniques used in wetlands can inhibit growth. If the wetland can be drained and then burned during summer, typha will not be able to survive with no water over winter. There have however been no controlled experiments carried out to demonstrate this method. Deep flooding can also cause declines in infestations. An effective control of Typha can be achieved by a combination of hand or mechanical cutting of stems followed by submergence of the remaining stems. Best results have been achieved by two clippings followed by submergence to at least 7.5cm or 3inches. typha are not shade tolerant, shading using black polyethylene tarps has been tried for killing growth. Degradation of the polyethylene tarps and problems of holding them down are some problems. Manual removal works best for small seedlings. They are easy to pull out in damp soil, care must be taken to see that all rhizome bits are removed otherwise the plants can reestablish itself (DPIWE, 2005). Mechanical: Mechanical removal of rhizomes is difficult because of their depth and volumn, however it can be used to reduce size of infestations and by following up with manual removal. The advantages of mechanical and manual removal are that no herbicide is used in water. Care should also be taken to ensure that the excavated material is taken away from the site and killed (DPIWE, 2005). Exposure of rhizomes to frost by cultivation of the site is a good method when water levels are low (DPIWE, 2005). 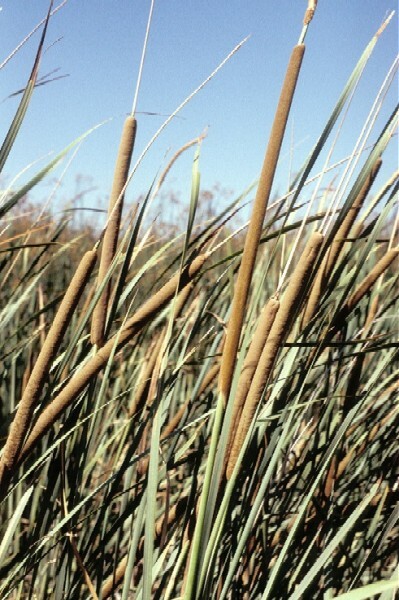 Chemical: Treating typha when flowering using herbicides has been found to cause the greatest stress. The disadvantage however of using herbicides is the large volumn of decaying matter that remains which can cause water to go foul and unusable (DPIEW, 2005). Wick and spray applications of Roundup followed by with follow-up treatements has been found to be effective. Treatment with herbicides like Dalpan followed up by respraying growing tips and making sure that the stems are submerged has been found to be successful. For more details of chemical control please see Motivans and Apfelbaum, 1987. For more option is herbicide treatment please see Chemical control (DPIWE, 2005). Informations on Typha latifolia has been recorded for the following locations. Click on the name for additional informations. Summary: This paper summarizes important aspects of the ecology of cattails pertinent to their control. The cattail family, represented worldwide by the genus Typha, is a perennial aquatic herb with cosmopolitan distribution in freshwater habitats. Department of Primary Industries, Water and Environment Tasmania (DPIWE) 2005, Weeds, Pests and Diseases. Cumbungi/ Bull rush (Typha spp.). Summary: Cattail control is an important consideration for natural areas. Monitoring the spread of cattails by aerial surveys and sampling transects can help determine the extent of cattail monocultures. Research into new biological control methods and the recovery of communities after cattail management needs to be conducted. Control techniques of fire and physical removal (cutting) in conjunction with flooding are most appropriate. Summary: The purpose of this study was to quantify cattail habitat in the Prairie Pothole Region (PPR) of North Dakota. Available from: http://skralston.com/Scott/Research/Scott%20Ralston%20ISC-04.pdf [Accessed 10 September 2005]. Summary: Previous authors have suggested that interspecific hybridization is common in cattails. This study found no putative hybrids based on surveys involving molecular and/or morphological traits. Thus, it did not detect any gene flow between the cattail species, despite opportunities for cross-pollination and F1 seedling establishment. USDA-ARS, 2005. National Genetic Resources Program. Typha latifolia L. Germplasm Resources Information Network - (GRIN) [Online Database]. National Germplasm Resources Laboratory, Beltsville, Maryland.